For Moncler, the Saul bomber jacket is the perfect vehicle to dress the young leaders of tomorrow. A confident attitude, details borrowed from dad’s wardrobe and the absolute freedom to move when fearlessly playing: these are the essential traits of a great adventure companion! Wash max 30°C - Very mild process; Do not bleach; Do not tumble dry; Ironing maximum temperature 110°C - without steam; Do not dry clean; Professional wet cleaning - very mild process; Dry flat; Wash separately; Do not iron decorations; It is advisable to wash and iron the garment on reverse. We offer a speedy Express shipping service. We also provide free pick up for your returns: you have 15 days from delivery to follow our quick and easy return procedure. For further information visit the Returns and Refunds section. Thanks to the "Pick up in Boutique" option you can choose to pick up your order in one of the Moncler boutiques. This service is complimentary. 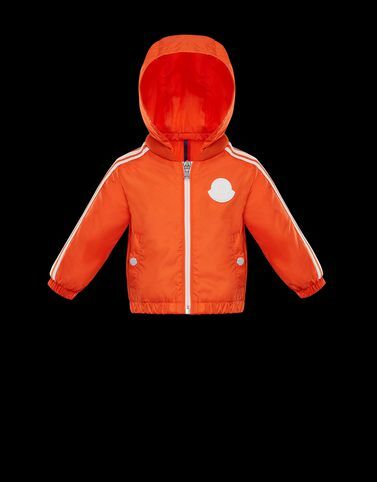 The size you selected is a 18-24 (Months) and corresponds to the 18 (MONCLER) shown on the label.